Integrating POS through Payroll, to drive profits, and streamline workflow. 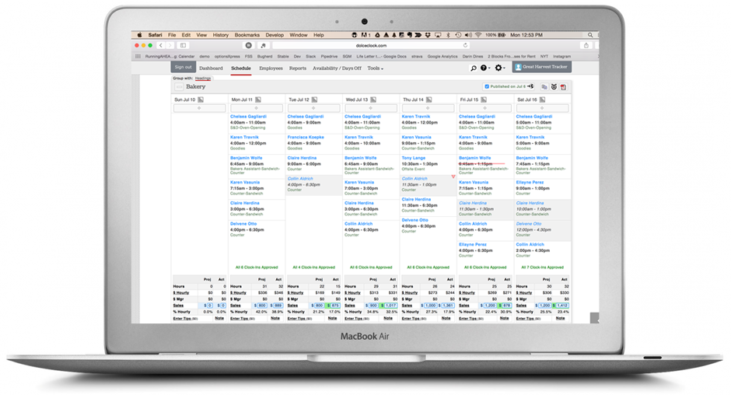 Meet the software that has made legacy systems and scheduling apps obsolete. Manage labor costs and access real-time labor analytics from a single “Labor Center". Tips are pulled from the POS to be pooled or distributed according to your rules and regulations of your state. Export gratuity data directly to payroll. Employee verification of time and breaks protects employers from future wage claims. Real-time alerting on labor activity enables immediate remediation opportunity. Reduce Payroll Prep time by up to 80%. Employees view schedules and time-punches, dialogue with management, and trade shifts. Employers enjoy mobile management. View individual location performance or rollup of sales and labor data across locations. Manage employees across multiple locations. Payroll data can be distributed to single or multiple EINs. Employers save thousands by restricting early or unscheduled Clock-In. Request & Approve, with Output to Payroll. Model labor budgets with predictive sales. A Dolce representative will reach out to answer questions and setup your account.